Due to me organising and running the event I didn't get to see that much of the talks, but I was room monitor for the downstairs track and so saw a great collection of talks. 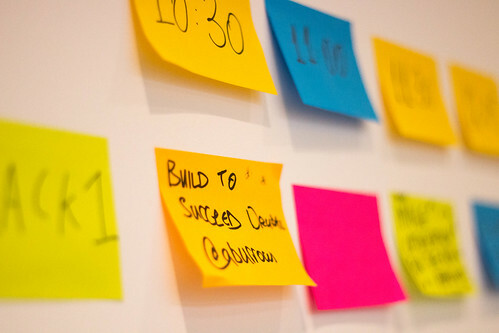 The first session I attended was with Alex Burrows, who talked about Building to Succeed. This was a look at some of the mistakes that people make when setting up Drupal sites and how he suggests solutions to those problems. This is stuff like getting a content type strategy correct, or using Views to display lists of items. Alex has just written a book called Drupal 8 Blueprints and he mentioned this a few times during the talk. I have since bought the book and am currently reading my way through it. Afterwards we had Image Optimisation For The Rich And Famous from Phil Wolstenholme, which was a look at how he tackled the problem of having extremely large images on a website. Through a combination of using an external service to shrink the image sizes down he then used a proxy service to cache those smaller images on the server. This took the page load times from over a minute to a few seconds, without changing any of the content on the site. Phil looked at different image shrinking techniques and show each step of the process as he went along. Phil normally delivers really good talks, and this was no exception. Just before some lunch there was Louise Howells with her talk on Delivering Experience. 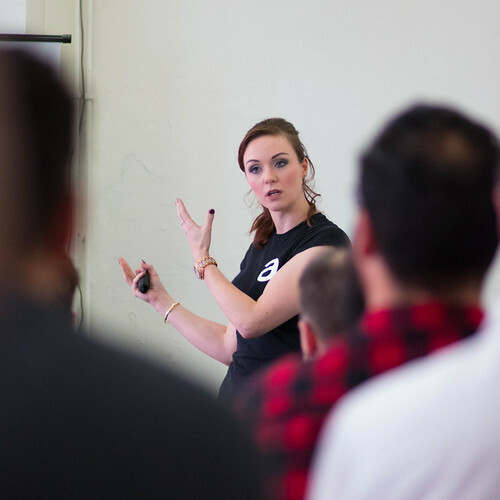 Louise looked at how to tailor experiences to deliver what the client asked for. She started out by looking at restaurant websties, which are almost universally terrible and forget the single most important aspects of a restaurant site, which is essentially the menu and the opening times. Louise looked at this through a story of trying to organise a meal with some friends and branched out from there. Giving the talk a narrative made it much more relatable. Lunch was served by Joe, our MadLab helper for the day, and consisted of a wide selection of sandwiches, crisps, fruit, and numerous other nibbles. I was a little apprehensive ordering sandwiches for the event, but they were really nice. Lots of people thanked us for the awesome lunch. Once lunch was finished we continued on with The Basics Of Unit Testing with Jamie Hollern. This was one of the better general approaches to unit testing that I have seen and Jamie showed a good depth of knowledge and experience. Of particular interest was Jamie's take on code coverage and mocking objects. He showed a project he had worked on in the past where a high degree of code coverage was required and demonstrated how much mocking was involved in getting things working. Mocking that many objects to test a single method in a single object was essentially pointless as it proved nothing. Next up was Michael Tresianu, who talked about The Deployer. This is a PHP based deployment system that I have been looking at using for a while so it was good to see how Michael had found using it. It turns out that he has created quite a robust atomic deployment system for Drupal 8 sites and was able to demonstrate a deployment in the session. After a coffee break we had Graham Brown, who was talking about Simple Server Setup Using Browser Based Webapp PuPHPet. This was a look at the puppet based PHP provisioning system and the PuPHPet webapp that allows you to customise the provisioning system to suit your needs. Graham walked us through the tool and what it produces after he downloads it. This was a good introduction to the tool and Graham made a good case for using it. The last real session of the day was What Happens When The Development Ends? with Myles Green. Myles is a project manager at Hydrant and his talk revolved around his role with customer support once the websites had been handed over. This allowed him to feed back some of the usual problems into the development cycle and allow the company to produce better products. He also demonstrated that he could provide first line support by learning how to use Drupal and how to solve many of the problems before needing to ask a developer. A good talk that had some valuable lessons. The final session was Slideshow Karaoke where we invited a few people to take to the stage and go through a series of 20 pictures in 6 minutes with a given subject. The slideshow code we used on the day is actually available on github if you are interested. This was just a bit of fun to round off the day but it went down really well. Once we were done we all moved to the nearest pub where we chatted and drank the night away. Overall, it was a really good day and everyone I spoke to said how great the event was. It's aways a risk to put on an event like this, especially in an unconference format, but I am really happy it went so well. Thank you everyone who made the day so awesome. Especially the other NWDUG Unconference organisers Eli and Irina. 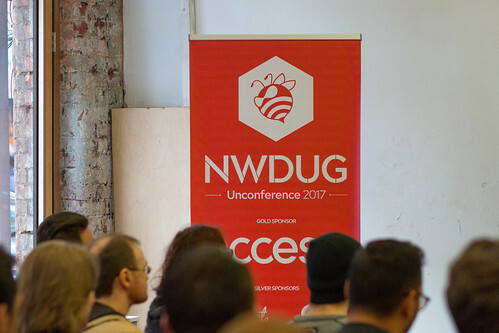 If you are interested, we are looking to put another unconference on next year and are just figuring out the initial details. We did learn a few things from this years event and will be looking to change some of the finer details of the event in 2018. First off, we will be carefully considering the opening of the day. We realised that we told everyone to get there by 9:00am, but only started the sessions at 10:30. This meant that even with the introduction session telling people how unconferences work a few people were sat around for a while waiting for the day to start. It was also quite cramped in MadLab with 55 people there, so next year we either need to have fewer tickets or perhaps select a different venue. 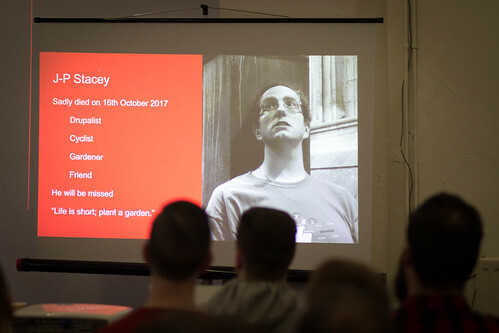 On a finally note, I should say that a good friend of the group, JP-Stacey, sadly passed away a couple of weeks before the event. He was the very first person to buy a ticket to the unconference and I know he would have loved the day. JP-Stacey was a well known member of the community and was someone I looked forward to meeting at the various camps around the country. We reminisced about him for a while in the pub after the event and raised a glass in his name. He will be missed. P.S. : Special thanks to Paul Johnson for taking some amazing picutres of the day. See the full slideshow on flickr.